Even if you are NOT experiencing a real estate dip, check out what Scott’s Motivation Minute has to say about your ATTITUDE. Contact Scott MacDonald 703-652-5777 Broker/Owner of RE/MAX Gateway for more information and motivation! Wow, November really flew by this year. It’s hard to believe that December is here already. At this rate, when we blink it will be a New Year. This being said, with December comes reflection and projection. Let’s reflect, this year, what resonates with me is that it was odd to say the least. Looking back, for the real estate business it has been especially challenging. We have not had a year where we couldn’t predict the market because there were no trends that lead the way for us. The harsh winter weather carried into May so there was no momentum from a spring market to carry us into the summer months. We had overly choosy buyers, rising inventory, fewer first time buyers, fewer investors, more inventory coupled with more days on the market plus even more. You name it, it happened and we couldn’t predict what would happen next. What we did have this year were very low interest rates – stable house prices – inventory was plentiful but nowhere near historic highs yet we had a “different” year. In a year where buyers should have been coming out of the wood work, they stayed on the fence. There are many in the business happy to see an end to this year from a business perspective. So, let’s talk about next year. We are expecting a strong spring market based upon what our top producing agents are talking about in our mastermind meetings. Many of them have buyers ready to buy homes, they have realistic sellers ready to put their homes on the market and rates will remain low through the spring market. We hit a low in first time buyers last year that we haven’t seen since 1987 but there are financing changes upcoming with lower down payment requirements and changes in regulations relaxing the tight underwriting standards we have had recently. These revisions will make first time buyers and Millenials a viable option that will help revive the housing market in the lower price points that will help the market flow up stream. We expect that the month’s supply of homes will remain between 3.5 – 4.5 months so sellers will need to be patient. Overall, we are optimistic that the real estate market will be strong in 2015. Have a fantastic, safe and relaxing holiday season with your family and friends. In the meantime, if you have any questions or concerns about your situation, feel free to call me. Unlike the weather, the real estate market is HOT! We currently have a 1.8 month supply of houses on the market in Northern Virginia. As I mentioned, right now our biggest issue is finding houses to sell. We currently have 3,850 properties for sale in all of Northern Virginia – down from a high of the last year when we had 6,005 in the second week of October. That is a 36% decrease in houses for sale in just 3 months. We expect more properties to come on the market as the ice and snow melt, as well as, into the spring market but we have a lot of people looking so I don’t see that it will have a huge impact in regards to our inventory level moving forward. The low inventory situation has resulted in multiple contracts on properties that are in great shape, priced well and show well. As properties come on the market that are in the same situation, they too will have multiple contracts. 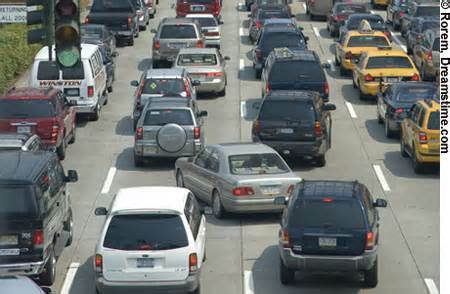 Therefore, buyers need to be prepared. We have developed a strategy to help buyers position their contracts to win when in competitive situations – check out my blog to learn more – www.scottymacsblog.com simply search for multiple contracts or click the link here. Sellers need to seek our advice when selling so we can help stage the house, give direction on what improvements/repairs need to be made and to price the home properly so they can take advantage of the market. As always, I am available to answer any questions you may have in regards to your personal situation so feel free to contact me anytime. You’re Invited! 8th Annual PUTT A THON and Family Fun Night! 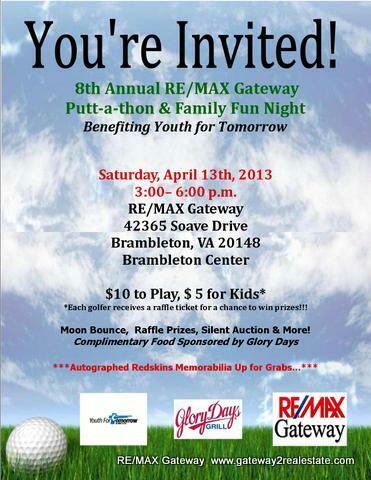 Scott MacDonald, President of RE/MAX Gateway invites you to the 8th Annual PUTT A THON & Family Fun Night! All proceeds benefit Youth For Tomorrow. Please join us Saturday, April 13, 2013 from 2-6pm at our RE/MAX Gateway office in the Brambleton Town Center for this fun-filled time and certain to bring out the kid-at-heart in all of us! This event is RAIN or SHINE! We’ve got it covered folks! 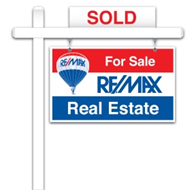 Just look for the RE/MAX Balloon!